Luxurious volume, wash after wash. Lifted weightless roots. Visibly thicker looking hair. Up to 48H volume and anti-flat. For fine, flat hair.Fine hair not only lacks body but also tends to quickly become flat and feels weighed down. What if science could give you more than nature did? 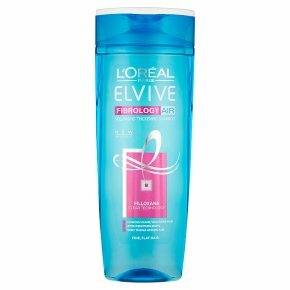 Our latest innovation in the science of haircare, L'Oréal Laboratories have created Fibrology Air enriched with Filloxane. Innovation: Clear technology with Filloxane Thickness Creation: Filloxane penetrates the fibre and expands it Long lasting volume at the roots: The clear formula cleanses and lifts roots with weightless volume. Your hair feels lifted, airy and fresher for longer. Directions for Use: Apply to wet hair, massage into a lather and then rinse. Follow with Fibrology Air Conditioner. IN CASE OF CONTACT WITH THE EYES, RINSE THEM IMMEDIATELY.